The newly elected Galway Chamber Committee pictured at the Chamber Offices on Merchants Road on Tuesday evening. Back Row L to R : Brian Carey, Bank of Ireland; David Niland, Galway Business School; John Gaffney, NUI Galway; Declan Dooley,; Dermot Nolan, Headspace Group Ltd; Andrew Murphy, Shannon Airport Authority. Middle : Pat Piggott, AIB; Niamh Costello, Galway Technology Centre; Enda McGuane, Winters Property Management; Patricia Staunton, Cushman & Wakefield; Frank Greene, Galway Technology Centre; Peter Allen, MacDermot & Allen; Elaine Brick, AECOM Ltd; Conor O’Dowd, KPMG. Seated : Mary Bennett, Treasure Chest; Aengus Burns, Grant Thornton; Dave Hickey, President, Maurice O’Gorman, Vice President, Carmel Brennan, Galway Chamber. 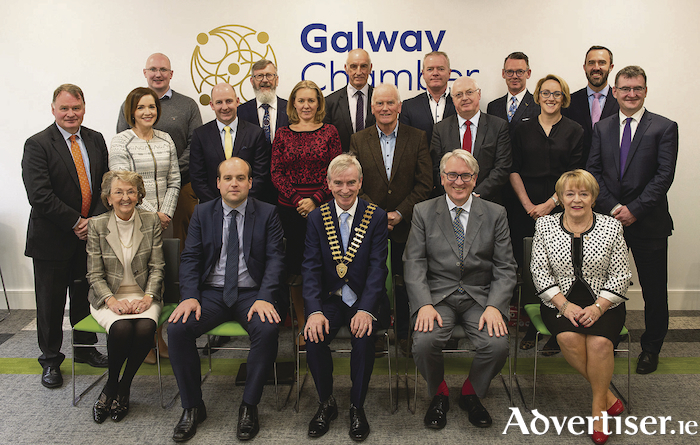 Are you a member of Galway Chamber? How can you benefit from being one? Here is a flavour of what the Chamber does. Its board members work on a voluntary basis with the executive team on both macro and micro elements to make business better for its members. It is an advocate for business and is a registered lobby group on behalf of its members. An example of this is its submission to the National Planning Framework where it sets out its views as to how and why Galway should develop in a certain way. This and other submissions can be accessed on www.galwaychamber.com One of its main functions is to act as an enabler of business, to create opportunities for its members to network and to do business. For example, it welcomed an average of 75 business people each time, to Boston Scientific, Ingersoll Rand and Medtronic last year for a networking breakfast and a tour of the company as part of its ‘Business Before Hours’ programme. On Wednesday May 23 it will host the event in Zimmer Biomet, Oranmore. Recently as part of its engagement with Udaras na Gaeltachta it brought members to Rosmuc to join its Connemara members and guests for an evening of networking in Ionad an Phiarsaigh. They urge all members to ‘Do business with a member first’ and all its events and gatherings are networking opportunities. Details on www.galwaychamber.com It is important to note that while its work in Galway Chamber is of benefit to the wider business community, Galway Chamber as a member organisation only promotes its member companies. This is key to its member community. Business Advisor - Chamber seminars, workshops and conferences feature experts presenting stimulating ideas and the latest thinking on business development. Discounted business services from member to member. Free promotion - You can use the chamber website to announce special offers or other business announcements. Membership directory listing and access. ‘Trusted third party’ and enabler of business. You can participate in its members only groups for social networking and updates. Lobbying to reduce yits costs including Commercial Rate charges from Local Government. It is there to represent its business interests and promote the competitiveness of business with Government. As acknowledged business leaders, we are listened to.